Did you ever have something that plays a big role in your life, a thing which impacts you and shapes who you are? You might not think that a little stain on the jeans of a 14-year-old kid could create a better future for many people, but Jessie Rose Schwartz, a new junior in Dana Hall this year, has turned the stain on her jeans into a lifelong impact. 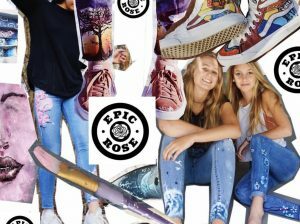 She has created a company, EPICROSE, which sells hand-painted apparel and donates 100% of her profit to food allergy research. Jessie suffers from a severe food allergy. Her allergy started when she was in 5th grade with the tree nuts and then evolved to coconut and sesame seed. It was a turning point in her life which took a lot of adjustment. “Obviously, very scary for me,” she said. But this scary allergy has changed her whole life. Jessie’s big idea was sparked in the summer going into sophomore year. As Jessie told me, “One day, I had a stain on my jeans and I was like wow, I should just like draw over that and cover it so I decided that I would just paint on my own jeans,” this is the little beginning which leads to her awesome project. Her first piece was a pair of high-waisted jeans with a butterfly on the thigh and flowers on the ankles. But her most challenging and most favorite project is the pair of Converse high top sneakers in a red hot chili pepper theme. “I think that’s kind of awesome and there’s the first thing that I’ve ever done for Men aside from a jacket. It’s kind of hard to figure out something that guys will be interested in buying but I think they are pretty cool,” she said. Every piece is 100% custom-made. 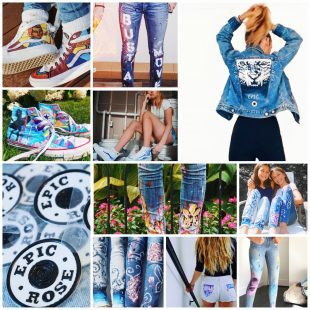 The style of the brand EPICROSE is the heart-made painting. Jessie always hides special little details in every piece, especially dots and splatters. “I’m really into designing details so there will always be special little details in everything,” Jessie said. Now Jessie is starting to work on a new project which nobody knows about yet. The new product will be with a reasonable price. “It will be something that everybody can take part in,” according to Jessie.